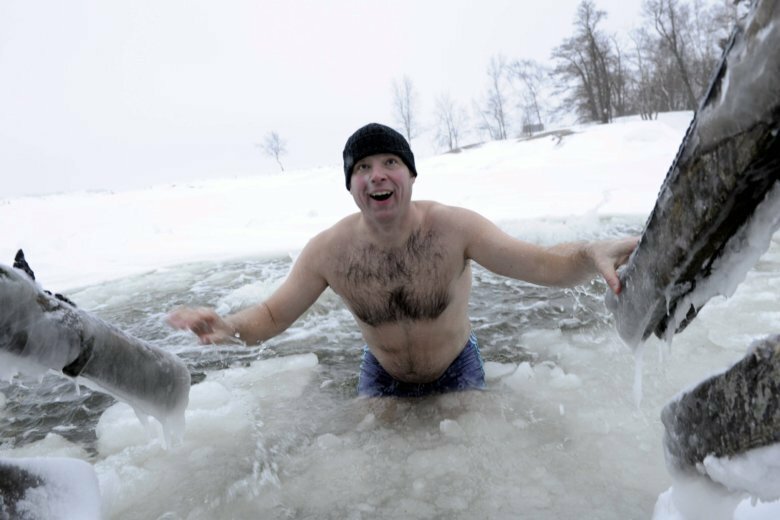 Diving into freezing temperatures may sound a little extreme, but it’s a popular activity in Finland, and one that this author says contributes to the country’s overall state of well-being. Find out other Finnish ways to health and happiness. WASHINGTON — When Katja Pantzar has a body ache, or is even feeling a little down, she goes for a swim … in ice-cold water. “I realized it made such a huge difference to how I felt physically and mentally,” said Pantzar, a Helsinki-based author and journalist, about her first time cold-water swimming. Studies show that cold-water therapy can ease symptoms of depression; others demonstrate it has some success in pain relief and recovery. Of course, experts warn it can also lead to hypothermia and an elevated heart rate in inexperienced swimmers, but Pantzar has only witnessed the positives. “A lot of people who winter swim say they don’t get colds or flus very often,” she said. If you don’t have access to an iced-over body of water, Pantzar said you can still give cold-water therapy a try with a quick cold shower or even a dip in the swimming pool at the beginning of the summer season, before the water has time to warm. Plunging into frigid water does more than invigorate the body; it demonstrates sisu — a Finnish concept that translates to grit, fortitude or perseverance. “Or, if you prefer, being a little bit of a badass,” said Pantzar, whose new book, “The Finnish Way,” guides readers through sisu-inspired paths to well-being. Braving bad weather is another example of sisu. In Finland, it’s rare that cold and rain keeps residents indoors. Finns spend a lot of time in nature — one-third of Helsinki consists of parks or other green areas — and Pantzar said this “forest therapy” plays into the country’s health and happiness. “Even 15 minutes in a green space, like a forest, helps lower your stress level, it has a whole bunch of positive effects,” she said. Being out in nature does have noted benefits, including lower levels of stress and blood pressure. Pantzar said she noticed a difference in her overall health after adjusting her commute to include a short bike ride through the forest. “And just doing these little things made a huge difference; it didn’t need to be complicated,” she said. Diet is another reason why Finland is one of the world’s leaders in health. Pantzar said the country’s eating habits, with a focus on “proper meals” and limited snacking, is one of the first things she observed when she moved there. “I just noticed that eating was not such a big deal. People didn’t have these extreme diets and a lot of people had this very sensible approach to eating a lot of vegetables and berries,” she said, adding that the cuisine is also rich in fish and rye bread.